It’s not often we get the opportunity to undertake a triple test, so when we got the call, we quickly rose to the challenge of doing battle with the holiday traffic heading west in order to check out Brig’s current best-selling models. Here in the UK, this popular brand of leisure RIB has been associated exclusively with the Wolf Rock Boat Company, but since the demand for the Brig range has grown, Wolf Rock have launched Brig UK and established a network of dealers, of which it is now one. Such are the politics of expansion! There’s good reason why Brig has become such an established make of RIB in the UK, and it goes beyond that which could be attributed to having strong brand identity. The fact is, the Brig appears to fulfil a particular need in the UK market and has done this well for a good number of years now. Furthermore, in terms of design and general styling, the Brig is recognisable, with a strong identity that has the advantage of standing out among the competition. Brig offer two distinct ranges in their portfolio: the ‘Eagle’ range, which is the premier model range, and the ‘Navigator’, which is aimed more at the ‘entry level’ and light commercial markets. Particularly in the case of the Eagle, its aesthetic appears to draw upon both Continental and British RIB styling, resulting in a model range that offers both sports boat-type comforts and purposeful seagoing functionality. It’s likely that a good number of Brig owners choose one of these craft because while on the one hand they understand the seagoing benefits of a RIB, at the same time they are not necessarily interested in purchasing an outright macho ‘mile-muncher’! They’re looking for something a little more family orientated. According to Brig UK, the best-selling model in the Eagle range is the 650. It’s comparatively well priced too at a little under 43k (inclusive of VAT), with a spec that includes a Suzuki DF150 TGL Lean Burn 4-stroke, galvanised trailer and every ‘extra’ required to make it a genuine ‘drive-away’ package. But then, within the sub-70k RIB price bracket, there are not that many direct alternatives to Brig’s current flagship, the Eagle 780, especially when you factor in its extensive and very comprehensive specification, which includes the very latest Suzuki 300APX V6 4-stroke outboard, its electronics package and a host of other items. Of course, there are many other makes of RIB, all with their own clear merits, and some, as we know, are exceptional in their abilities and standard of construction. But in this particular sector of the leisure market, the Brig Eagle offers an attractive option because these RIBs are now one of the few brands available in the UK that promote the leisure benefits of combining both Continental and northern European design influences. Indeed, the Eagle’s large-diameter tubes are perhaps more akin to many of the Mediterranean brands, such as Lomac, Capaldi or even Stingher, than those of UK origin, but the introduction of the military-grey, fabric impression Hypalon that comes as standard on these boats gives them a purposeful as well as a very high-quality finish. The big-diameter tubes also provide a reassuring degree of stability at rest, so they don’t rock from side to side readily, and thanks too to the high-gunwale effect of the tubes in relation to the inset self-draining deck, these craft offer a good degree of on-board security – a plus, especially with young children in mind. The Eagle’s chunky rearward-raked GRP arch mast and style of passenger seating give further indication of Continental-type styling. 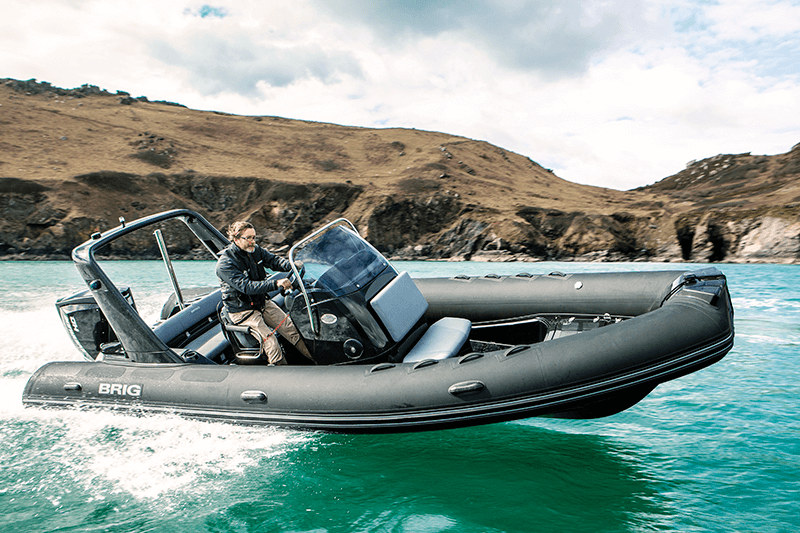 Even though these RIBs are robust and able, the personnel at Brig UK openly admit that they’re not necessarily seeking to market these boats as all-out offshore craft. They see their market as being the ‘family’ sports boat-orientated market, and it’s in this sector that the company has done very well indeed. I can see the sense, therefore, in many of the fit-out choices Brig have made – the choice of seating being one such example. The advantage of bench-styled seating, of course, is all the storage it offers in the unit itself beneath the seat top. And aboard these Eagles, one thing you quickly come to appreciate is the huge degree of storage they offer – even the 650 has something like five big locker compartments and a good-sized wet anchor locker. Indeed, every opportunity has been exploited on these boats to provide as much storage as possible accessed via robust hatches with good-quality s/s catches. Unlike some other craft that feature bench-styled seating, the double helm seats on these craft are adjustable, so the user can have the option of either sitting behind the helm console or lifting the seat into the ‘bolster’ position. The latter works well and in particular assists the driver when additional forward visibility or control at the helm is required. I would, however, like to see a handhold/grab point provided on the port-side bulkhead to the 650’s seating unit. This would give the navigator additional security underway. When seated, a footplate to brace your feet against is a nice addition, and the protection afforded by the high screen is good on both models. The screen’s wrap-around steelwork also gives some useful handholds as well as safeguarding the cox and navigator from the screen’s leading edge. But a word about the angle and height of the windscreen of the 650: it does have to be respected, particularly in lively conditions, where its close proximity and angle to one’s face becomes evident. The 780’s helm console and windscreen design are very different to the 650 and the latter is set well forward, hence its leading edge doesn’t present any safety issues as such. Nevertheless, people naturally grab the top of a screen to steady themselves even when just walking around a boat, so a wrap-around stainless rail to this item would be a practical addition. An additional attachment to the rearward face of the double helm seat is a functional and attractively designed picnic table, which, when in place, contributes to a great rear-deck hospitality area and thus helps to maximise the social attributes of the high-sided stern seat beneath the arch. The upholstery to this seating, as in the case of the other seats on these vessels, is fashioned in Silvertex – a very high-quality waterproof material that remains impressively resistant to salt water and sunlight. This material and the quality of the seating upholstery add to the Eagle’s overall internal finish. The substance and quality of the Eagle’s internal components is obvious, and in RIB terms at least, there appears to be a lot here for your money. This, as we said, is thanks to the typical Brig ‘standard’ specification being very generous and including such items as a Garmin GPS plotter and sounder, an Icom or Garmin VHF radio, boarding ladder, compass and navigation lights, stainless steel ski mast, colour-coordinated padded sun deck infills and, in the case of the 780, SeaDeck luxury deck surfacing, a freshwater shower, a Fusion sound system and even a bimini ‘sun top’. Another key feature of the 780 flagship model is its extra-large centre console. Besides proving a very substantial helm station, internally this cavernous unit can either be installed with a sea toilet or provide a mini overnight cabin for two reasonably trim adults who don’t mind getting friendly! At the very least, it affords a fabulous ‘glory hole’ to keep all your kit and personal belongings safe and dry. The ergonomics, in terms of the helm and related controls to these models, all work well, and the Brig offset helm console design not only gives easier access fore ’n’ aft but also helps balance the boat when underway, countering its natural prop torque. Rather oddly, both boats have exactly the same-size 340-litre fuel tank, which, bearing in mind that the 780 is rigged with a 300hp, means the cruising range of the smaller, 650 model is potentially far greater. That doesn’t make much sense to me. But the location of these underdeck tanks assists in keeping the COG of the craft down and aiding their stability and handling at speed. The 650 is a very sporty boat and was a lot of fun to drive coupled to the Suzuki DF150 TGL in-line 4-stroke outboard, which featured on its transom on the day of the test. But its responsiveness, from ‘out of the hole’ and right up through the rev range, is impressive, topping out at a speed of just over 50mph. All credit to the 680, though – she remains impressively stable and sure-footed at speed and through all her turns. The test day afforded us a variety of sea states, from flat clam protected water to a healthy chop and swell – so every opportunity to discover whether the 650 has a tendency to either fly her head or bury her nose! Happily, she did neither, and so the quality of ‘predictability’, being a prerequisite for a family-orientated sports boat, was met very satisfactorily in my view. She also proved an outstandingly dry boat in a beam sea – a lot of fun to drive and very level, both laterally and in her angle of attack. But as in the case of the 780 and the other models in the Eagle range, the fixed trim tab-like GRP transom extensions they feature do have a big bearing on not only how these boats run but also the extent to which they respond to the engine trim. The extensions certainly keep these boats very level, but because they are fixed/immovable, the degree to which the helmsman can affect the hull’s trim angle is lessened greatly to within a very small bandwidth. You couldn’t, for instance, trim these boats out fully to establish that minimum wetted area to the hull that not only reduces drag but also allows a planing hull to perform to its maximum degree. The design of these Brig Eagles simply will not let you go there. It’s as if the manufacturer has predetermined or preset the trim angle of the boat. That said, the possible ‘upside’ from the seller’s point of view is that a lot of boat owners have little or no idea how to trim a boat, and getting it wrong can result in a boat suffering from either poor or even dangerous handling characteristics. So this particular design detail to the Eagle’s hull is in fact a ‘limiter’, and it can’t be argued that it keeps these boats both safe and predictable to drive. We spoke of the 680’s sporty feel, so what of the 780? How does she handle? You might think that she’s simply a bigger version of her smaller cousin. But you would be wrong, because the 780 feels every inch the ‘saloon’ as opposed to the ‘GT’. Yes, the vessel has a mighty turn of speed – no surprise there, of course, because she’s coupled to a truly monster-sized outboard: the Suzuki DF300 APX V6 Lean Burn outboard, no less (a stunning motor … smooth, ultimately powerful, ergonomically beautiful and impressive both in full-on performance mode and when being driven economically in her ‘sweet spot’ cruising setting). But again, like the 650, the nature of the 780 gives much reassurance in terms of her ability to handle this degree of power safely. I’m not convinced about the wisdom of putting massive amounts of power on the back of a leisure boat that could be sold to a customer who has little or no idea how to drive a fast and potentially lethal projectile – for that is what any fast planing boat can be in the wrong hands. This boat will hit 60mph – but full credit to her, throughout our trial the 780 handled her full complement of 300 ‘horses’ with ample ability, confidence and style, and for this reason the boat once again won my respect. I will point out, though, that on the test day, the boat suffered from a fair degree of ‘prop slip’, thanks to her transom ‘jacking plate’/the height of her engine appearing not to have been set up correctly. This was mildly irritating but an issue easily corrected. Would I want to undertake long distances or go extended cruising with the 780? Not really – she’s not set up, or designed, for long distance or ‘enduro’-type cruising, especially in the types of conditions we can get around our coasts. That’s not a criticism, it’s just that this boat is primarily designed for more leisurely and coastal cruising, water sports, socialising and all-round family use. That doesn’t mean to say that you couldn’t cross the Channel in her because she certainly would look after you, but you’d obviously want to choose your conditions. The advantage of the Eagle over a traditional, hard-hulled sports boat is its inherent RIB ability to get you home safely if the weather does blow up. Your friends and family are not going to get frightened or worried about the boat being overwhelmed because she’ll simply keep battling away pretty much through anything until you get back into port and tie up alongside the pontoon again. Thanks to the Eagle’s self-draining decks and the massive buoyancy of those big tubes, whatever water these boats might ship in a heavy sea will not present a problem. And at the end of the day, isn’t that why most people choose to buy a RIB – for that reassuring, ‘get you home’ comfort factor? Both the 650 and the 780 are likable, well-made craft that have a real place in the UK market. They represent genuine, turnkey packages and are sold by people committed to delivering both quality and good value. Understanding your market is the secret of success, and as their record now shows, Brig UK, I believe, do just that. 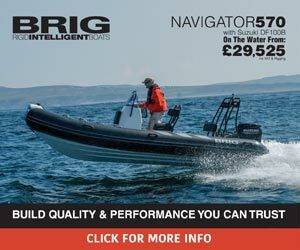 The Brig Navigator is the second range offered by Brig UK and one that is aimed more at the entry-level market. That said, unless I’m missing something here, its pricing doesn’t seem to be that much different to the Eagle range, which features a noticeably more sophisticated fit-out. The Navigator’s more simplistic design is in some ways more akin to traditional UK RIB design and would no doubt work well also for light commercial work-related uses. Besides the functional interior of the craft, one of the main differences between this and the Eagle is the fact that the Navigator’s deep-vee hull does not feature the tab-like extensions common to the former. The transom to these craft is of standard design and hence allows the driver to have full use of the engine trim. The 700 model we trialled on the Eagle test day featured a Suzuki DF225 TX V6 4-stroke outboard. This hull and engine combination certainly displayed a good turn of speed, which topped out comfortably the right side of 50mph. Whereas the Eagles tend to land on the midsection of the hull, the Navigator digs its stern in that little bit deeper to land off a wave more on the rear third of its hull. But to be honest, I didn’t think the Navigator’s hull was as soft-riding as the Eagle’s, and though I didn’t have the time to ascertain exactly why, this 700 just didn’t feel as ‘sweet’ as the Eagle to drive and made heavier work of the conditions than I would have liked. Nevertheless, she displayed no alarming tendencies and handled in a reliable fashion through all her paces and turns. Indeed, the Navigator is a safe and well-mannered boat to drive. Though the test boat was fitted with bench seating, I believe the Navigator range can have jockey seats installed if a customer requires such. The Brig catalogue offers a range of different seats and other factory items. A jockey seat-styled interior, I think, would be more suited to the Navigator’s functional style and overall concept. Powder-coated black metalwork, high-quality plain-finish ORCA Hypalon and a more basic helm console design all add to the theme. As in the case of the Eagle, the Navigator’s fit-out and list of standard ‘extras’, such as electronics, auto bilge pump and SeaStar hydraulic steering system etc., ensure that this too is a genuine ‘turnkey’ package. As tested, this Navigator 700 coupled to the Suzuki 225hp comes in at £48,995 (inc. VAT).